I coded a new website, the Danville – Pittsylvania County Corridor Studies, a website designed and managed by IIr Associates. 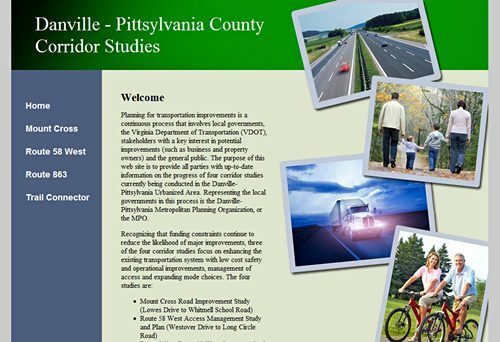 IIr Associates, Inc. has posted a new website this week for Danville – Pittsylvania County Corridor Studies. The website is designed and managed by IIr Associates, and coded by Jimmy Allen of GetYourWebsiteHere. This simple and easy-to-navigate website allows the West Piedmont Planning District Commission to quickly post their study results for the general public to review. Four study locations are presented, public meeting dates are announced, and study results in pdf file format are made available for downloading. This website is an example of how the internet can bridge planning commissions, engineering firms and the interested public. Information is made available for review by all parties, in the hope that citizens and their representatives can make better informed decisions.